A.S. King is the award-winning author of young adult books including Reality Boy, Ask the Passengers, Everybody Sees the Ants, and The Dust of 100 Dogs. She has visited hundreds of schools to talk about empowerment, self-reliance and self-awareness. Find more at www.as-king.com. "High-school senior Vera never expects her ex-best friend, Charlie, to haunt her after he dies, begging her to clear his name of a horrible accusation surrounding his death. But does Vera want to help him after what he did to her? Charlie’s risky, compulsive behavior and brand-new bad-news pals proved to be his undoing, while Vera’s mantra was always “Please Ignore Vera Dietz,” as she strives, with Charlie’s help, to keep a secret about her family private. But when Charlie betrays her, it is impossible to fend off her classmates’ cruel attacks or isolate herself any longer. Vera’s struggle to put Charlie and his besmirched name behind her are at the crux of this witty, thought-provoking novel, but nothing compares to the gorgeous unfurling of Vera’s relationship with her father. Chapters titled “A Brief Word from Ken Dietz (Vera’s Dad)” are surprising, heartfelt, and tragic; it’s through Ken that readers see how quickly alcohol and compromised decision-making are destroying Vera’s carefully constructed existence. Father and daughter wade gingerly through long-concealed emotions about Vera’s mother’s leaving the family, which proves to be the most powerful redemption story of the many found in King’s arresting tale. Watching characters turn into the people they’ve long fought to avoid becoming is painful, but seeing them rise above it, reflect, and move on makes this title a worthy addition to any YA collection." "The death of a best friend is hard enough, but for high-school senior Vera Dietz, her reaction to the death of Charlie Kahn is complicated by the fact that in the last few months he’d dumped her for the druggie pack at school, especially tough-girl Jenny. Flashbacks and compact commentary from Charlie himself, from Vera’s straitlaced dad, and from an omniscient local landmark interweave with Vera’s current narration, painting the picture of Vera and Charlie’s close friendship and its recent souring and revealing that Vera is the guilty and troubled possessor of many secrets about her late friend. King offers a perceptive exploration of a particular kind of friendship, one where one friend is undergoing agonies beyond the power of the other to help. Vera’s own troubles—her abandonment by her mother, the strictness and emotional evasion of her recovering-alcoholic father—get sympathetic treatment, but it’s clear that Vera is loved and cared for in a way that Charlie, stuck in a poisonous, abusive home, simply wasn’t. Yet it’s Vera’s life even more than Charlie’s that’s under scrutiny here, especially since Vera still has the possibility of making changes, both in her dealing with Charlie’s memory and in her ongoing relationships. The writing is emotional yet unfussy, and Vera’s tendency to see and perceive Charlie in every place and every thing is both effective and affecting. It’s not uncommon for the dysfunction in one friend’s life to start sowing seeds of doom for a friendship, and Vera’s poignant take on her double loss will resonate with many readers." "It is hard to describe how deeply affecting this story is. Vera and Charlie are both the victims of extremely bad parenting, but that only scratches the surface of the novel. The writing is phenomenal, the characters unforgettable. The narrative weaves through the past and present, mostly from Vera's viewpoint but with telling asides from other characters. There is so much in here for young people to think about, presented authentically and without filters: drinking and its consequences; the social hierarchy of high school; civic responsibilities; and teens' decisions to accept or reject what their parents pass down to them. 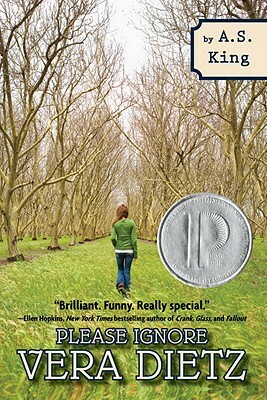 It is a gut-wrenching tale about family, friendship, destiny, the meaning of words, and self-discovery. It will glow in the reader for a long time after the reading, just like the neon red pagoda that watches over Vera and her world."